Boys Nin-ja-stics is a 55-minute class in our Big Gym for boys 5 to 9-years-old. This is a combo gymnastics and ninja warrior obstacle course class. 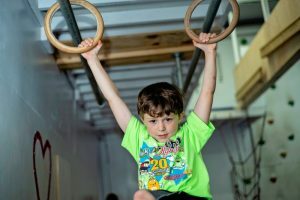 In the gymnastics portion, boys will grow their strength and learn basic gymnastics core skills, necessary positions and support holds in this class. A strong emphasis is placed on building strength, increasing flexibility and improving coordination through gymnastics equipment. Boys will utilize specific equipment like the bars, vault, rings and tumbling floor. Handstands and flipping skills on the trampoline will be emphasized. In the ninja kids portion, boys will attempt our multi-obstacle course and two warped walls which are designed to teach coordination, critical thinking and improve strength. The ninja elements are always changing and surprising students with the next challenge. With each class, your child will grow confidence and self-esteem as they learn to master any challenge they face. Ninja Kids is a 55-minute class in our Big Gym for boys and girls ages 5 to 7-years-old and 8 to 13-years-old. 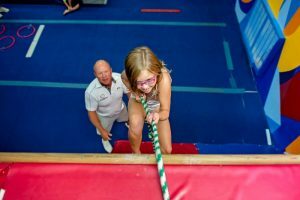 You’ve seen it on TV, but now your child can try to conquer the two warped walls we have at OKG! Our multi-obstacle course is designed to teach coordination, critical thinking and improve strength. The ninja elements are always changing and surprising students with the next challenge. With each class, your child will grow confidence and self-esteem as they learn to master any challenge they face.